Aromatic and flavorful, the dishes in 200 Easy Mexican Recipes combine an alluring blend of flavors with a relatively simple and colorful presentation style to guide the home chef in creating great Mexican meals for the whole family. And the recipes are really easy. Inspired by authentic dishes, these foolproof basic recipes bring the flavors of Mexico into the home kitchen. Made with ingredients easily found at local grocery stores, the recipes are quick to make, easy to serve, and affordable — quite simply, a selection of some of the best Mexican dishes ever. In addition to all the fabulous and exciting dishes, Kelley Cleary Coffeen offers a wonderfully interesting account of the traditions and culture surrounding Mexican cuisine, along with a handy glossary of the flavors of Mexico, an ingredient list, and a list of a tools and equipment. Readers of Cooks&Books&Recipes know that I’m all about easy cooking. So when “easy” is part of a cookbook title, I pay attention. But easy by itself isn’t enough. Recipes also need to be trustworthy or imaginative or both. And when it comes to Mexican food, well, I’ll just say this: I’ve lived in border states (Texas, Arizona, California) for more years than I’m going to admit publicly here, and I’ve had way more than my fair share of Tex-Mex, Mexi-Cali, and Southwestern food. I love it all. Based on my review of this cookbook, I can tell that Kelley Cleary Coffeen does too. I want to cook every single recipe in this cookbook. That rarely happens for me. OK, wait, I’ll confess: after all these years, I still can’t get myself to even want to try menudo (beef stomach), and I also am still no fan of stuffed jalapenos. But that’s it. I want to cook everything else in this cookbook (see my “next-to-try recipes” list below). Whether you’re new to the cuisine or, like me, have been enjoying it for years, this is your go-to cookbook for Mexican recipes. The bonus is that they’re also easy to prepare and cook. Score! About the Author: Kelley Cleary Coffeen grew up along the southern border of the United States and developed a love for Mexican food and the unique culture of the Southwest. She developed a love for cooking at the age of 15, when she started baking a peanut butter brownie recipe she found in Seventeen Magazine. It became a favorite with all of her neighbors, giving Kelley the great satisfaction of pleasing others with food; she has been cooking ever since. 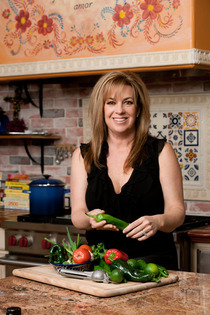 Her creativity in the kitchen has resulted in a flourishing culinary career.The author of five cookbooks, Kelley is also a food consultant and media personality.